We’ve moved on to Stage 2 of the Singapore Conversation. We’re talking about specific issues regarding Singapore identity and culture now. Here’s my 2 bits’ worth: A Singapore identity must evolve organically. It’s not about flags and the national anthem. It’s about the lives we live, who we are. It’s about Singaporeans creating a body of art and literature that is resonant with our voices and our shared experiences. The Billion Shop is an anthology of stories resonant with the voices of Gen-X Singaporeans. I was immediately hooked by how truly Stephanie had captured the displacement of those young globalized Singaporeans and contacted her for an interview. Turns out, she’s a typically glocal Singaporean who went to school in Singapore, studied for a BA in English in Chicago, and then returned to work as a journalist here before spending 3 months last year at the prestigious University of Iowa International Writing Program. Here’s our e-conversation about how she synergizes all her writing influences, including her cats, into her writing. I enjoyed writing short stories as class exercises in school, but never considered myself the creative writing type — I believe I thought creative writing was nerdy and joined the drama club instead. Still, I have fond memories of the “compositions” I produced, one of which was about the end of the world. I titled it Dies Irae (Day of Wrath), after my favourite part of Mozart’s Requiem. I wish I’d kept a copy of it. It was only during my undergraduate days that I started writing seriously — by which I mean, writing with the idea that I would like the story to be read by people other than my teacher. I studied at the University of Chicago, and the long Midwestern winters encouraged me to stay indoors with my laptop and a large cup of coffee. As a young person having the adventures of growing up and of living in a foreign country, I had a lot of issues to work through, to say the least, and writing fiction was a means to make sense of my experiences. generally well-behaved in college — so I had to invent characters and situations to spice things up. How did those early writings evolve into The Billion Shop? The four stories in The Billion Shop, especially City In C Minor, somewhat reflect the mindspace I occupied in Chicago even though I actually wrote all four stories after my return to Singapore. 20-something writer living in a rapidly globalising society to tackle. It was Kenny Leck of Singapore’s legendary indie bookstore BooksActually who persuaded me to put together the four stories for the chapbook published by the bookstore’s Math Paper Press. I must really thank him for this: If not for him, I wouldn’t yet have any solo publications to my name. or her in your own work. Having said all that, I’ll just list here a few novels that I always find myself returning to when I’m stuck while writing something, and want to study how the author created a certain effect that I myself am striving for. – The Go-Between by L.P. Hartley. – Also, the short stories of Jhumpa Lahiri. Is there a group of other writing practitioners that you rely on for critiques, emotional support and networks?… In that respect how did your time at the University of Iowa International Writing Program affect your writing practice? – I must mention my first-ever writing instructor, the Havana-born American writer/translator Achy Obejas, who taught me in college. Whenever I re-read my work during the editing process, it’s with the critical eye honed during her workshops. – Closer to home, there are the poets Yeow Kai Chai and Toh Hsien Min. They both edit the Quarterly Literary Review Singapore, the online journal which is probably Singapore’s premier showcase of new writing in English, and they’ve been very encouraging to me and many other new writers. They’ve also been very kind and patient in writing references for me for some programmes I’ve applied for, so I can never thank them enough. Funnily, outside of the (small but growing) Singapore literary scene, Kai Chai is my former boss at a newspaper, while Hsien Min lives down the road from me. – The award-winning poets Yong Shu Hoong, Alvin Pang and Cyril Wong are active in nurturing the literary scene here, organising readings, mentorships, writing projects etc. I’ve definitely been a beneficiary of their efforts, and the Singapore lit scene would not be as exciting without writers like them, who care not merely about their own advancement but that of the scene as a whole. The next generation of such movers and shakers (by which I mean, my age or younger) includes Ng Yi-Sheng, Amanda Lee Koe and Wei Fen Lee, who manage to edit journals and anthologies while producing their own great writing. – There’s also Jason Erik Lundberg, an American based in Singapore, who edited a speculative fiction short story anthology I contributed to and who’s been a tireless cheerleader for new writers in Singapore. – We writers would also be nowhere without lion-hearted, eagle-eyed publishers such as the aforementioned Kenny Leck of Math Paper Press, Fong Hoe Fang and Chan Wai Han of Ethos Books, Enoch Ng of firstfruits and Edmund Wee of Epigram. – I’m also fortunate that one of my best friends from high school is a fellow writing practitioner — Joshua Ip, who published his first collection of poetry, Sonnets From The Singlish, last year and will soon publish his second. Despite my motto to judge the art and not the artist, I must admit that it is interesting when you think you know someone pretty well, then you read their writing and you realise they have all these concerns and obsessions you never knew about. – There are also prose writers I admire such as Dave Chua, Yu-Mei Balasingamchow and O Thiam Chin, though we keep in touch via Facebook rather than meeting up for coffee — alas, our modern generation. – Moving on to the International Writing Program: Taking a bunch of writers from different countries, writing in different languages, and sticking them in a small town in the middle of cornfields is exactly as it sounds — calculated genius and inspired lunacy. I had such great fun and met so many wonderful people there, and I’m afraid I spent more time socialising than writing. The sheer luxury of spending three months doing nothing but thinking about writing, and talking about writing with fellow writers, was nothing short of amazing. I returned to Singapore with renewed determination, a momentum that has carried me forward in my current literary projects. – But writers near and far aside, my first reader of anything new I’ve written is my husband. Although he works in finance, he is still pretty well-read and imaginative, and I almost always end up using any edits he suggests. What advice would you give to a Singaporean author starting out? The same advice I would give any author from anywhere: Keep writing a lot, and keep reading a lot. And… what are you working on now The Billion Shop’s done? I actually intended (and still intend) that the four stories in The Billion Shop be part of a larger narrative I’m working on. Currently though, I’m editing a short-story anthology devoted to the domestic cat, titled From The Belly Of The Cat (after an award-winning Singapore poetry collection titled From The Belly Of The Carp, by Roger Jenkins, though I must admit the title is what I remember most about the collection). The plan is for Math Paper Press to publish it in time for the Singapore Writers Festival in November this year. 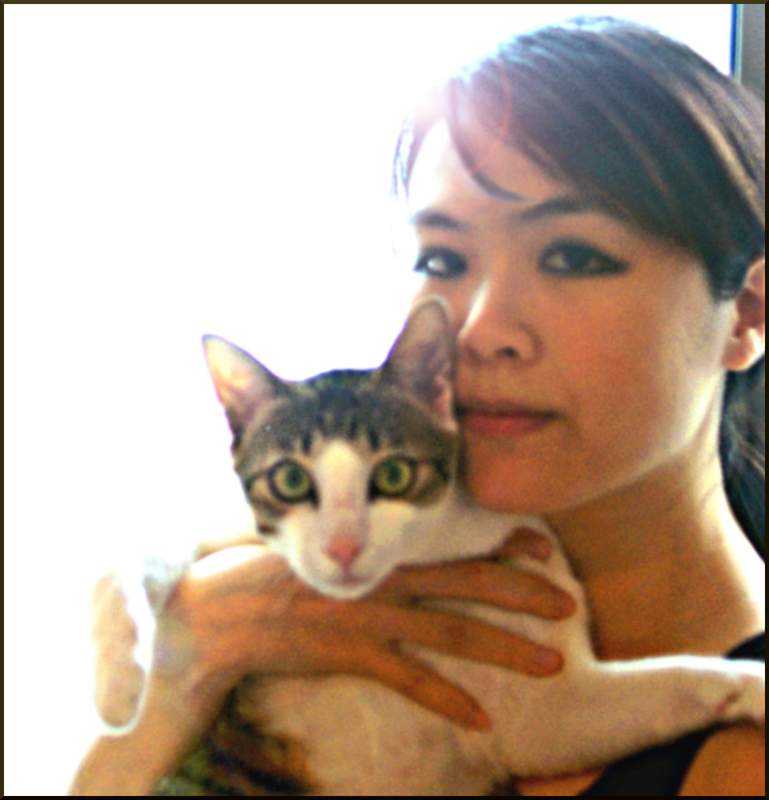 The indefatigable Kenny Leck and I are both cat lovers, and a cat-themed anthology is simply the next logical step in our efforts to spread the good news about our feline leaders (while furthering the development of Singapore Literature, of course). More personally, I’m working on a novel titled First Light From The Farthest Star, which has a sci-fi element. So I am returning to my roots as a writer of apocalyptic compositions with pretentious titles! Such self-deprecation. Yes! If that develops organically as part of the Singapore identity, how cool would that be? As a first step in the organic development of that Singaporean identity, why not read more Singapore authors. Go to http://booksactually.bigcartel.com/product/the-billion-shop-by-stephanie-ye and put in an order for Stephanie’s book. When you’re done reading, let us know what you think. about the book. First Light From The Farthest Star, sounds like something I would read. Let us know when that comes out and thanks for an interesting read. “…creating a body of art and literature that is resonant with our voices and our shared experiences.” –> great idea! I will definitely add The Billion Shop to my reading list, I love the author interview!